my sister and I did the half day tour as we only had one day in Agra. S.A.M same day tours provided the tour with Shyamveer being our guide. It was amazing! Shyamveer picked us up in a clean and aircon taxi with Pradeep being our driver and we headed to the Taj Mahal. we were able to leave our bags in the taxi and they were safe at the Taj, only small bags are allowed. Shyamveer was so helpful, he paid for the electric tuktuk to the entrance to the Taj as cars can only go so far, he also helped us buy tickets for the Taj and as well as being so knowledgable and able to answer all our questions, he also acted as our photographer! he talked us through some of the history of India as a whole as well as how the Taj came to be built. we then headed to a large shop that had a live demonstration of how the semi precious stones were inlayed into the marble, obviously this was an opportunity to buy souvenirs but there was no pressure to purchase anything. we then headed to Agra Fort and again Shyamveer was very knowledgeable of the building, the architecture and the history of the building. Pradeep was even happy to call in to a shop so we could buy lunch on the way back to our hotel. 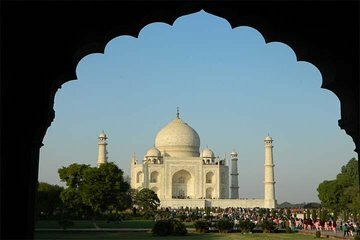 This is the perfect tour if you are short on time in Agra and want to see 2 of the biggest, most famous sights.